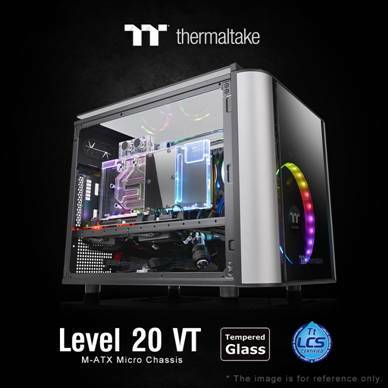 Thermaltake, a leading premium gaming tower manufacturer, announced the immediate availability of Thermaltake Level 20 VT Micro Chassis. Thermaltake is thrilled to show the latest TT Premium product line – the Level 20 Series which commemorates 20 years of dedication to the PC industry. The Level 20 VT is the pocket rocket of the Level 20 series, offering massive support inside an M-ATX footprint. The Level 20 VT is designed to prove that micro cases don’t have to be small on power. It boasts a 200mm fan preinstalled at the front as well as great liquid cooling support, four 4mm tempered glass panels and interchangeable panels with filters. The VT also has a split-level design with a flat motherboard tray that lets you hide away cables, while showing off liquid cooling hardware at the top. The Level 20 VT takes our latest case innovations and wraps them in an ultra-modern, space-conscious style that’s utterly unique in the case market today.